Parents around the world can relax, knowing that their kids won’t inherit all of their stresses — at least at the DNA or epigenetic level. In an animal model, neuroscientists at Yerkes National Primate Research Center have shown they can reverse influences of parental stress by exposing parents to behavioral interventions following their own exposure to stress. “These results in our mouse model are an important public health contribution because they provide optimism for applying similar interventional approaches in humans and breaking intergenerational cycles of stress,” says lead author Brian Dias. More information here. The research was published in Biological Psychiatry, and is a continuation of Dias’ work with Kerry Ressler on this topic, which earned some attention in 2013. Note: the mice weren’t inheriting a fear as much as a sensitivity to a smell. Even so, it remains an intriguing example of how transgenerational (um, since the word “epigenetic” is so stretchy now) influences can be studied in a precise molecular way. 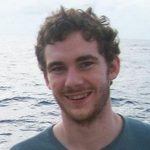 Editor’s note: Guest post from Neuroscience graduate student Brendan O’Flaherty. Companion paper to the Gourley lab’s recently published work on fasudil, habit modification and neuronal pruning. 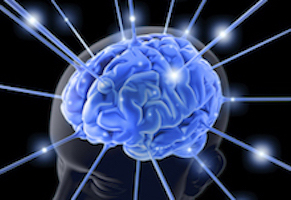 An Emory study has discovered why teenager’s brains may be especially vulnerable to cocaine. Exposure to small amounts of cocaine in adolescence can disrupt brain development and impair the brain’s ability to change its own habits, the study suggests. The results were published in the April 1, 2017 issue of Biological Psychiatry, by researchers at Yerkes National Primate Research Center. Drug seeking habits play a major role in drug addiction, says senior author Shannon Gourley, PhD, assistant professor of pediatrics, psychiatry and behavioral sciences at Emory University School of Medicine and Yerkes National Primate Research Center. 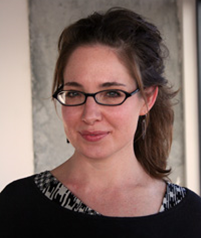 The first author of the paper is former Emory graduate student Lauren DePoy, PhD. When it comes to habits, cocaine is especially sneaky. Bad habits like drug use are already very difficult to change, but cocaine physically changes the brain, potentially weakening its ability to “override” bad habits. Although adults are susceptible to cocaine’s effects on habits, adolescent brains are especially vulnerable. “Generally speaking, the younger you are exposed to cocaine in life, the more likely you are to have impaired decision making,” Gourley says. To understand why adolescent brains are especially vulnerable to cocaine, the researchers studied the effects of cocaine exposure on how the mice make decisions about food. 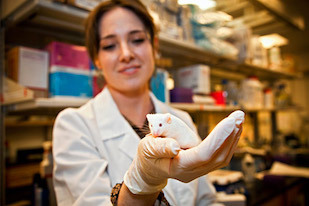 Researchers injected adolescent mice five times with either saline or cocaine. Both groups of animals then grew up without access to cocaine. Researchers then trained the mice to press two buttons, both of which caused food to drop into the cage. Since both buttons rewarded the mice equally, the mice pushed each button half the time. Over time, pushing the two buttons equally could become a habit. To test this, the researchers then played a trick on the mice. When one of the buttons was exposed, the researchers starting giving the mice food pellets for free, instead of rewarding them for button-pressing. The placebo effect plays a big role in clinical trials for mood disorders such as depression. Emory psychiatrist Andy Miller hit upon something several years ago that could clear a path around the placebo effect. A recent paper in Psychotherapy and Psychosomatics from Miller and psychiatry chair Mark Rapaport looks at clinical trials testing an anti-inflammatory drug against psoriasis, to see whether participants’ depressive symptoms improved. This sidesteps a situation where doctors’ main targets are the patients’ moods. When it comes to approving new antidepressants, the FDA is still probably going to want a frontal assault on depression, despite provisions in the 21st Century Cures Act to broaden the types of admissible evidence. Still, this line of research could clarify who could benefit from anti-inflammatory treatments and illuminate viable biomarkers and pathways. Two studies now underway at Emory specifically recruit patients with high levels of the inflammatory marker CRP, which Miller’s previous study showed was helpful in predicting response to infliximab. Low estrogen levels may make women more susceptible to the development of post-traumatic stress disorder (PTSD) at some points in their menstrual cycles or lifetimes, while high estrogen levels may be protective. New research from Emory University School of Medicine and Harvard Medical School provides insight into how estrogen changes gene activity in the brain to achieve its protective effects. The findings, published in Molecular Psychiatry, could inform the design of preventive treatments aimed at reducing the risk of PTSD after someone is traumatized. The scientists examined blood samples from 278 women from the Grady Trauma Project, a study of low-income Atlanta residents with high levels of exposure to violence and abuse. They analyzed maps of DNA methylation, a modification to the shape of DNA that is usually a sign of genes that are turned off. The group included adult women of child-bearing age, in which estrogen rises and falls with the menstrual cycle, and women that had gone through menopause and had much lower estrogen levels. Happiness can be elusive, both in personal life and as a scientific concept. That’s why this paper, recently published in Molecular Psychiatry, seemed so striking. “A genome-wide association study of positive emotion identifies a genetic variant and a role for microRNAs.” Translation: a glimpse into the genetics of positive emotions. Editorial note: Although the research team here is careful and confirms the findings in independent groups and in brain imaging and fear discrimination experiments, this is a preliminary result. More needs to be explored about how these genetic variants and others affect positive emotions. “With relatively few studies on genetic underpinnings of positive emotions, we face the challenges of a nascent research area,” the authors write. Perhaps ironically, the finding comes out of the Grady Trauma Project, a study of inner-city residents exposed to high rates of abuse and violence, aimed at understanding mechanisms of resilience and vulnerability in depression and PTSD. “Resilience is a multidimensional phenomenon, and we were looking at just one aspect of it,” says first author Aliza Wingo. She worked with Kerry Ressler , now at Harvard, and Tanja Jovanovic and other members of the Grady Trauma Project team. Emory researchers have identified molecular mechanisms that regulate motivation and persistence in mice. Their findings could have implications for intervention in conditions characterized by behavioral inflexibility, such as drug abuse and depression. Scientists showedÂ that by manipulating a particular growth factor in one region of the brain, they couldÂ tune up or down a mouseâ€™s tendency to persist in seeking a reward. In humans, this region of the brain is located just behind the eyes and is called the medial orbitofrontal cortex or mOFC. The results were published WednesdayÂ inÂ Journal of Neuroscience. Being able to appropriately determine the value of a perceived reward is critical in goal-directed decision making, a component of drug-seeking and addiction-related behaviors. While scientists already suspected that the medial orbitofrontal cortex was important for this type of learning and decision-making, the specific genes and growth factors were not as well-understood. 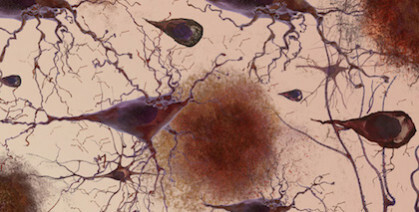 The researchers focused on brain-derived neurotrophic factor (BDNF), a protein that supports the survival and growth of neurons in the brain. BDNF is known to play key roles in long-term potentiation and neuronal remodeling, both important in learning and memory tasks. Variations in the human gene that encodes BDNF have been linked with several psychiatric disorders. Research on depression must deal with a major obstacle: the placebo effect. This is the observation that patients improve in response to the sugar pills given as controls in clinical studies. Emory psychiatrist Andrew Miller and his team have been developing a different approach over the last few years: studying symptoms of depression in people who are being treated for something else. This allows them to sidestep, at least partially, the cultural construct of depression, from William Styron to Peter Kramer to direct-to-consumer television ads. Miller and his colleagues, including Jennifer Felger and Ebrahim Haroon, have documented how interferon-alpha-induced inflammation affects the brains of hepatitis C and cancer patients in several papers. That research, in turn, informs their more recent fruitful investigations of inflammation in the context of major depression. More on that soon. Violence and trauma are certainly not gifts, but scientifically, the Grady Trauma Project keeps on giving, even after co-director Kerry Resslerâ€™s 2015 move to Massachusetts. Research at Emory on the neurobiology of post-traumatic stress disorder (PTSD) continues. This Nature Communications paper, published in December with VA-based psychiatrist Aliza Wingo as lead author, is an example. The focus on PTSD co-occurring with depression. As the authors note, several studies looking at traumatized individuals found PTSD and depression together more often than they were present separately. This was true of Atlanta inner city residents in the Grady Trauma Project, veterans and survivors of the 2001 World Trade Center attack. DICER: the gene whose activity is turned down in blood samples from people with PTSD plus depression. Its name evokes one of the three Fates in Greek mythology, Atropos, who cuts the thread of life. DICER is at the center of a cellular network of regulation, because it is part of the machinery that generates regulatory micro-RNAs. The findings recapitulate work in mouse models of stress and its effects on the brain, with a connection to the many-tentacled Wnt signaling/adhesion protein beta-catenin. The results were published online on Nov. 10 inÂ Molecular Psychiatry. The findings bolster the case that the high-inflammation form of depression is distinct, and are guiding researchersâ€™ plans to test treatments tailored for it. 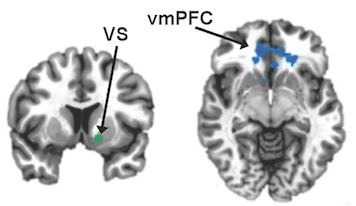 Emory researchers have found that high inflammation in depression is linked to a “failure to communicate” between two parts of the brain: the ventral striatum (VS, vertical cross section) and the ventromedial prefrontal cortex (vmPFC, horizontal). Images from Felger et al, Molecular Psychiatry (2015). In 2013, Brian Dias (at Yerkes) and Kerry Ressler (now at Harvard) describedÂ a surprising example of epigenetic inheritance. They found that a mouse, exposed to a smell in combination with stress, could transmit the resulting sensitivity to that smell to its offspring. At the time, there wasn’t a lot of information about mechanism. Now other scientistsÂ haveÂ substantiatedÂ a proposal that micro RNA in playing a role in sperm. See this story (“Sperm RNAs transmit stress”) from Kate Yandell in The ScientistÂ or this one from Rachel Zamzow at Spectrum, the Simons Foundation’s autism news site, for more. An added wrinkle is that thisÂ research showsÂ that descendantsÂ of stress-exposed mice show a muted response to stress. Note for Emory readers: Dias is scheduled to give a Frontiers in Neuroscience talk on Friday.